The Government announced today (February 20) in a detailed response that it has fully accepted the recommendations tendered by the Task Force on Land Supply (TFLS) on land supply strategy and eight land supply options worthy of priority studies and implementation. The Secretary for Development, Mr Michael Wong, said, "The problem of land shortage in Hong Kong is pressing. The Government fully agrees with the observations of the TFLS on land demand forecasts and establishment of a land reserve, and will accordingly implement a more robust and visionary land supply strategy to sustain and significantly increase land supply. "The land supply strategy comprises the following five elements: (i) increase land supply on a sustained basis as the core strategy; (ii) aim to build up a land reserve; (iii) continue to adopt a multi-pronged strategy; (iv) commission technical assessments and studies as early as possible; and (v) adopt an infrastructure-led and capacity creating approach in planning and providing strategic transport infrastructure." Mr Wong said, "To strengthen the Government's high-level steer in overseeing and coordinating the strategy and planning of land supply, the composition and terms of reference of the existing Steering Committee on Land Supply (SCLS) chaired by the Financial Secretary would be expanded. The expanded SCLS will adopt a vision-driven and forward-looking approach in re-assessing our land demand for housing, economic, community and recreational needs and the scale of land reserve that we should target for. 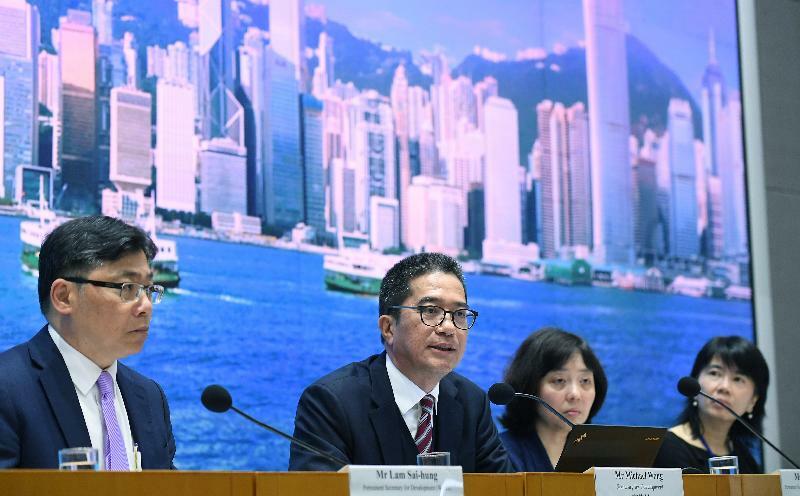 The revised assessment will be incorporated into the final strategy for 'Hong Kong 2030+: Towards a Planning Vision and Strategy Transcending 2030' to be released in the latter half of 2019." 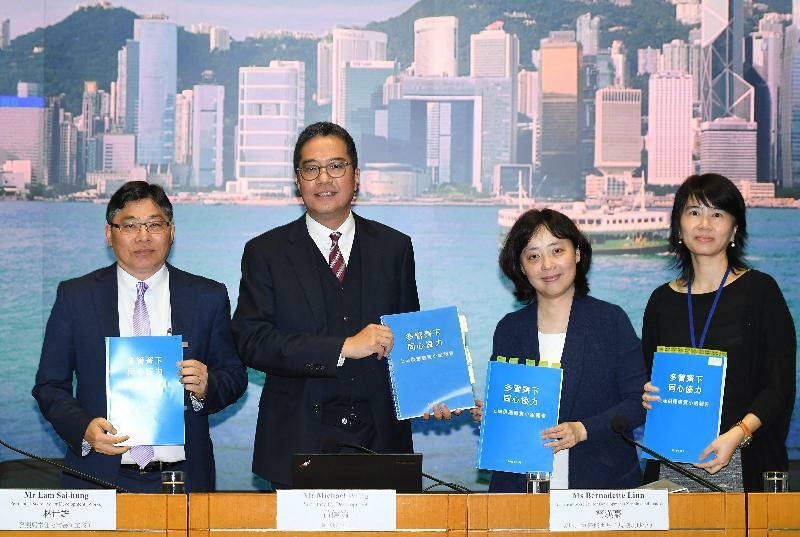 As regards land supply options, Mr Wong said the Government will implement a number of specific measures to take forward the eight land supply options worthy of priority studies and implementation as recommended by the TFLS, including expediting brownfield development; drawing up details of the Land Sharing Pilot Scheme to unleash development potential of private agricultural land; developing 32 hectares of land east of Fan Kam Road of the Fanling Golf Course for housing development and commencing relevant detailed technical study; expediting studies on the some 1000-hectare Kau Yi Chau artificial islands; expediting studies on near-shore reclamation projects including Lung Kwu Tan, Sunny Bay and Siu Ho Wan; continuing cavern and underground space development and studies; pressing ahead with New Development Area projects; and commencing studies on the River Trade Terminal site and the coastal areas of Tuen Mun. Besides, he said that the Government will not at this stage further pursue the alternative land use of country park periphery. Mr Wong said the next step of the Government is to pull together the efforts of relevant bureaux and departments in finding and creating land at full steam to ensure a sustained and sufficient supply of land, not only to meet the development needs of Hong Kong in different times and for different purposes, but also to prepare for rainy days and build up a land reserve, thereby creating more favourable conditions for our housing, livelihood and long-term development. He said, "The Government is determined and confident to implement the enhanced land supply strategy and eight priority land supply options. We hope that members of society can join hands and render support to the Government's efforts, including securing funding approval from the Legislative Council for commencing various studies and works, so as to take forward the recommendations of the TFLS as soon as possible." Having conducted an extensive public engagement exercise, the TFLS submitted its report to the Government on December 31, 2018. The Government's response to the recommendations and major comments in the report of the TFLS is at Annex.